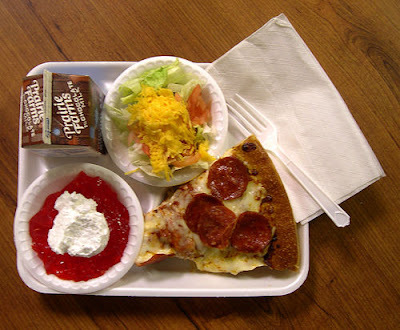 Contents: Pepperoni pizza, jello with whipped cream, chocolate milk, salad with shredded cheese. Notes: Healthy? No. Delicious? Yes. God, I miss American pizza. Real pepperoni cooked crispy around the edges, cheese with actual flavor, pizza sauce that`s not gaggingly sweet and pizza dough that tastes best after sitting in a fridge all night. Mmmm. Tastes like democracy! Japanese pizza is crap most of the time. Anyone wanna try a shrimp brocolli mayonaise pizza with corn, potatoes, guv`mint style cheese and squid ink tomato sauce?